Move over, Ford. Tesla is now the second most valuable car company in America. Tesla's stock surged nearly 6% on Monday to an all-time high after the maker of electric cars reported strong sales of its Model S and Model X vehicles. Ford's shares sank 3% following a weak sales report for March. 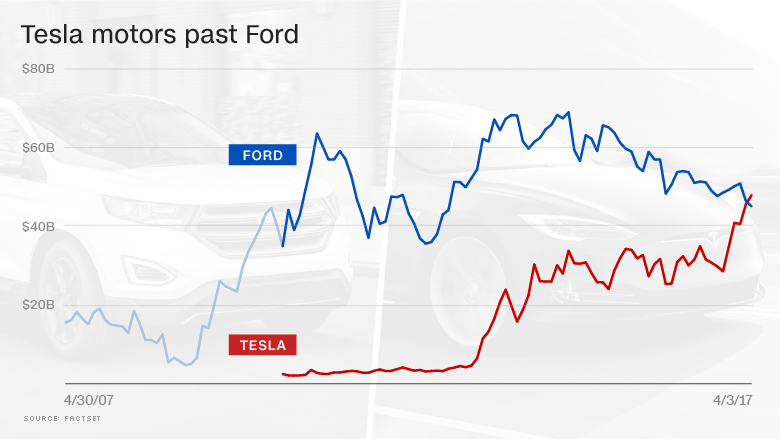 As a result, Ford's (F) market value is about $45 billion, while Tesla's (TSLA) has climbed to almost $48 billion. Tesla also inched closer to GM (GM), whose stock fell 4% after it reported both a sales increase that was well below forecasts and higher inventories. GM's market value is $50.8 billion. And Tesla is not far behind Japan's Honda (HMC). It's worth about $54 billion. Shares of GM and Ford are now both lower for the year, while Tesla's stock has soared more than 35%. Tesla doesn't sell nearly as many cars as Ford, GM or Honda -- or other auto giants like Fiat Chrysler (FCAU), Toyota (TM) and Volkswagen (VLKAF). Tesla said Sunday that it sold about 25,000 of its Model S and Model X vehicles worldwide in the first quarter. Ford sold more than 617,000 just in the United States. GM sold nearly 690,000 cars and trucks in the first three months. And Tesla, unlike GM and Ford, is still losing money. It's expected to report a loss for the next few quarters and all of 2017. But investors seem excited about Tesla's upcoming Model 3 car, which could help make Tesla a more mainstream auto company instead of just a luxury electric car maker. The Model 3, which is expected to be available later this year, should cost about $35,000 -- significantly less than the Model S sedan and Model X SUV. Last year, Tesla said in a regulatory filing that it had already received 373,000 pre-orders for the Model 3. The company hasn't updated those figures. Tesla isn't the only company making a cheaper electric car, though. It's going to face tough competition from GM, which has the Bolt, and from Nissan (NSANF) and its Leaf. Tesla also has a lot on its plate in the next few months and years as the company seeks to integrate its recent acquisition of SolarCity -- a company run by two cousins of Tesla CEO Elon Musk. An analyst at Goldman Sachs downgraded Tesla to a "sell" rating at the end of February because of concerns about the SolarCity deal and about how much Tesla plans to spend on three more of its Gigafactories for battery and solar panel production. 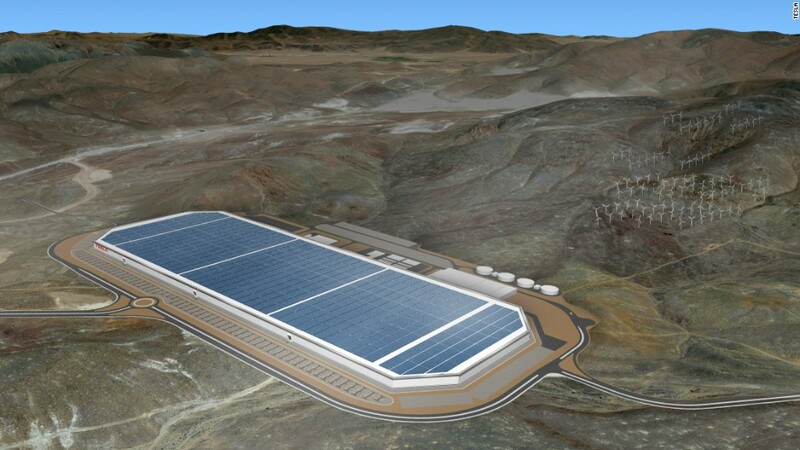 Tesla already has one plant for batteries in Nevada and another in Buffalo, New York, for solar panels. Musk could also be distracted by the many other projects he's involved with, most notably his rocket company (and perennially rumored IPO candidate) SpaceX. Of course, the Goldman analyst has been dead wrong so far. The stock is up nearly 20% since the "sell" recommendation. The shares got a boost last week after Chinese tech giant Tencent announced it was taking a 5% stake in the company. So could Tesla one day become the most valuable car company in the world? In addition to Ford, it's already passed Nissan and Fiat Chrysler. If it tops GM, next up among the major global brands would be VW, which is currently worth about $70 billion. After that, it's a long road before Tesla could top the number one car company. Toyota's market value is $160 billion. But Musk might not even be satisfied if Tesla gets to that level. Two years ago, he boldly predicted that Tesla could one day be worth as much as Apple (AAPL). Apple was worth $700 billion at the time and is now worth about $750 billion. Musk will have to sell a lot of Model 3s and solar roofs to get there.